Reflecting on the history and architectural space of St John on Bethnal Green, this collaborative installation by visual artists Arabella Lee and Pauline Thomas with poet Samuel Brenton hovers on the themes of time and oblivion. Not the time of the clock or events, but the time of an invisible underlying order that takes place without us. 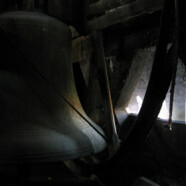 The images and sound resonate and linger within the confinement of the Belfry Tower.